Sometimes we don't take time to think about simple "obvious" things or to seriously consider older bodies of research. Here's a gem from 1986 that I found recently. 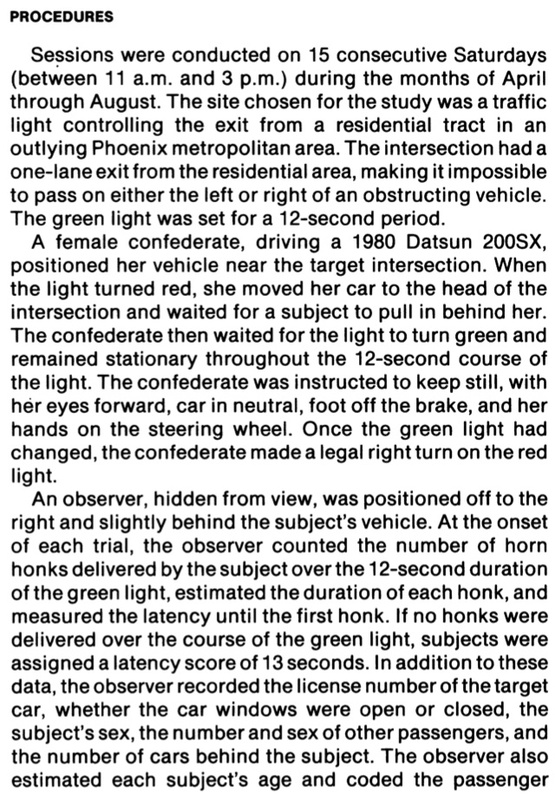 Using a method developed in previous field studies of aggression, this study examined the influence of ambient temperature on responses to a car stopped at a green light. To investigate alternative models of the effects of high temperature on interpersonal hostility, the study was conducted during the spring and summer in Phoenix, Arizona, and included a range on the temperature humidity discomfort index up to 116 degrees F. Results indicated a direct linear increase in horn honking with increasing temperature. 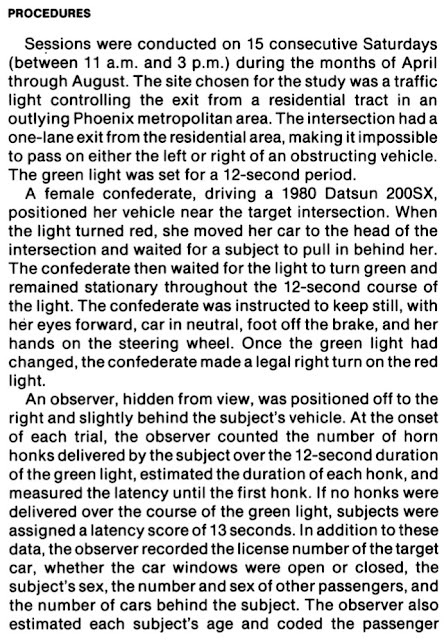 Stronger results were obtained by examining only those subjects who had their windows rolled down (and presumably did not have air conditioners operating). 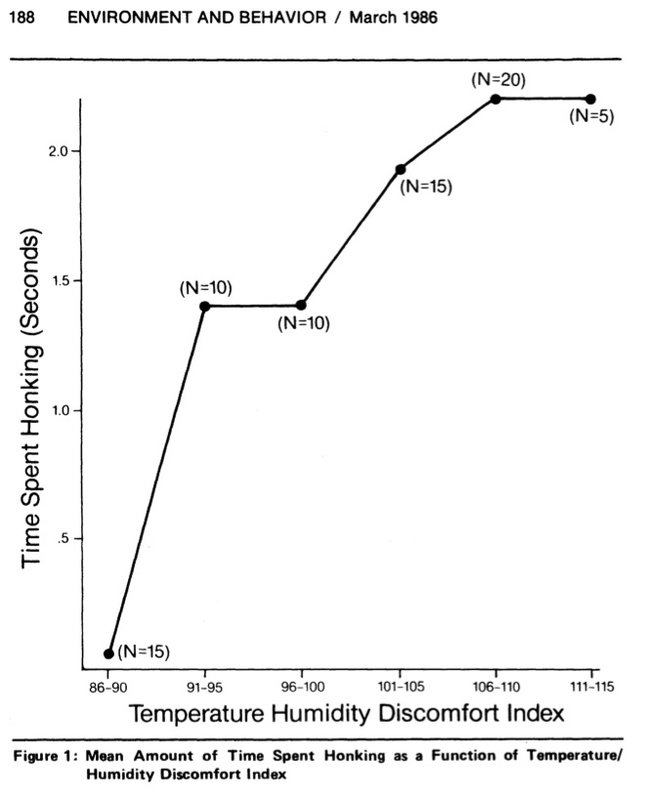 This relatively older literature on temperature and aggression is reviewed here. It seems to be something that psychologists studied for a while, but hasn't been discussed at all in the highly technical discussions of climate change impacts. Perhaps it could add something to the recent controversy over the idea that temperature changes can lead to conflict? In my reading of the recent literature, I don't think this mechanism was ever discussed. Somehow we manage to miss simple and "obvious" mechanisms when we think about complex global processes.